Another package exploded in Austin, Texas, Sunday, leaving two men injured and putting the city further on edge. It marked the fourth time this month that a package left somewhere exploded, as Austin police continued to work with the public in investigating three previous deadly explosions. According to the Washington Post, the fourth package bomb was slightly different. The first three packages were left on the front steps of homes and then detonated after unsuspecting victims tried to pick them up. The fourth one was left on the side of a road, and police believe it was possibly hooked to a trip wire that set it off after two men in their 20s passed by on their bicycles. The two men were injured in the explosion on the 4800 block of Dawn Song Drive, a residential area. 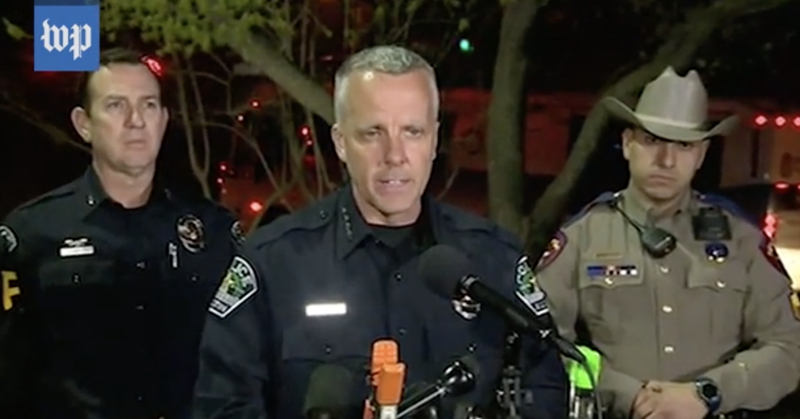 “We are working under the belief that this is related to the other bombing incidents that have occurred in our community over the last couple weeks,” Austin Police Chief Brian Manley said at a news conference early Monday morning. The two men were rushed to the hospital with serious but non-life-threatening injuries and were reported to be in good condition. Following Sunday’s explosion, Manley encouraged residents in the surrounding areas to remain in their homes as investigators looked into what happened. However, as sunset was upon the area at the time, he acknowledged that police may not know until later whether other devices were left in the neighborhood. Ten days later, that theory was thrown out after two more package bombs exploded. One blast killed 17-year-old Draylen Mason, a high school senior, while the other bomb seriously injured 75-year-old Esperanza Herrera. Both House and Mason were relatives of prominent members of Austin’s black community, and both of them also had relatives who were friends. House’s stepfather, Freddie Dixon, a former pastor at a historic black church in Austin, noted that he was good friends with Norman Mason, Draylen’s grandfather, who was known for having mentored black student-athletes at the University of Texas at Austin for decades. His wife, LaVonne Mason, is a co-founder of the Austin Area Urban League. Dixon told the Post that he did not think that connection was a coincidence. “Somebody’s done their homework on both of us, and they knew what they were doing,” he said. There is currently no known connection between Herrera and the other victims, but because all three victims in the previous bombings were either black or Hispanic, authorities have not yet ruled out the possibility that the victims were targeted because of their race, although there is no hard evidence currently supporting that theory. As the Post notes, the races of the two men injured Sunday have not been disclosed. On Sunday, the Police Department increased to $100,000 the reward for information leading to the arrest of the person responsible for the first three bombings. Texas Gov. Greg Abbott also offered another $15,000. “These events in Austin have garnered worldwide attention, and we assure you that we are listening. We want to understand what brought you to this point, and we want to listen to you,” he said.